A couple vegetables thrown together and mixed with a thick and aromatic pesto, I love these dishes, easy and uncomplicated! 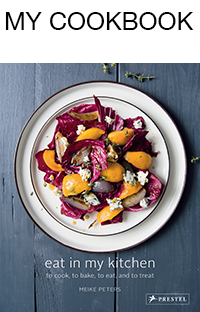 You can eat them warm or cold, as a salad, side or main and they are just as perfect on a brunch table as they are for a light dinner with a glass of rosé wine and some crunchy bread. 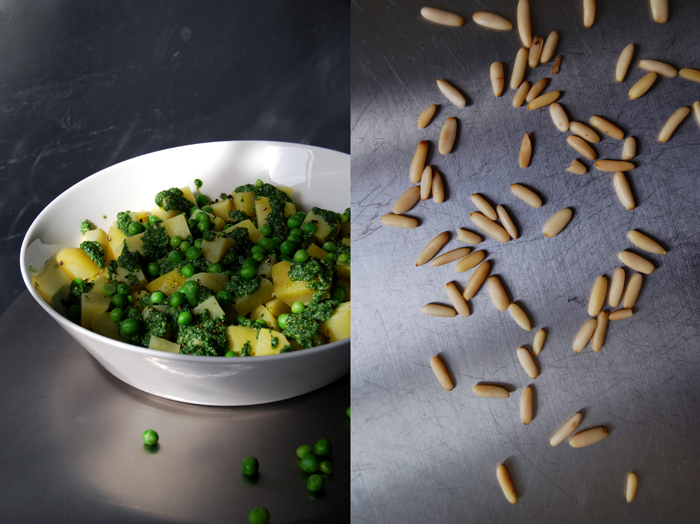 In a month we’ll be in Malta and these are the kind of recipes I like to prepare for lunch when the temperature gets closer to 40°C (104°F) and I can feel it slow down the pace of my kitchen activities. 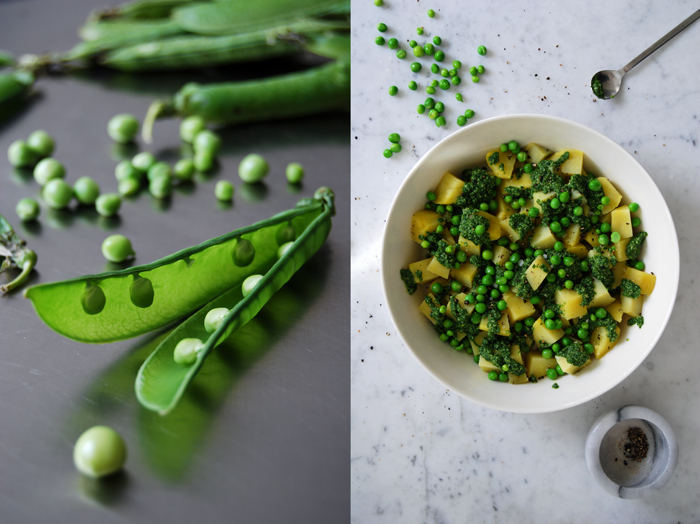 You never know how many people will meet at the table, 2, 6 or 8, but a full bowl of potatoes, peas and rucola pesto will please even the biggest Mediterranean family! This recipe is just as nice with pasta but this time I went for potatoes, the pesto gives them a Southern touch which suits them well. My first idea was to use basil but then I remembered the rucola (rocket) pesto I had made for my Easter lamb chops, so I changed my mind. The rucola adds a soft spiciness, a contrast to the sweet peas. I sprinkled some crushed black pepper on top and my coarse sea salt from Gozo and we ate most of it for lunch, still warm, but the cold leftovers were just as nice! Cut the potatoes into cubes. 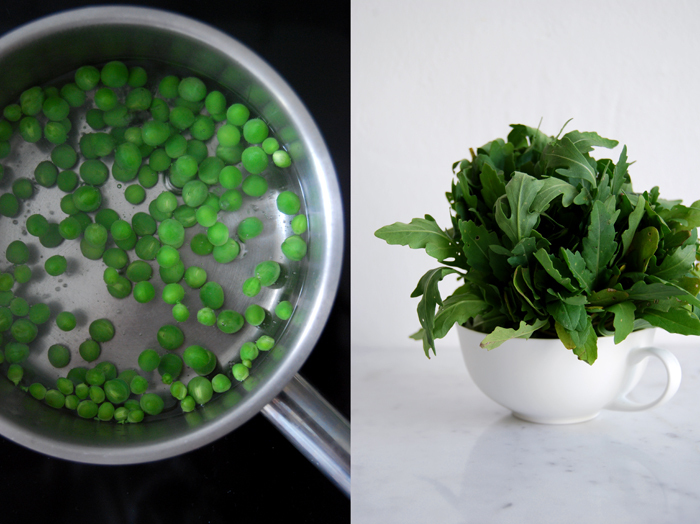 Blanch the peas in boiling sugared water for 1 minute and rinse with cold water for 1 second. 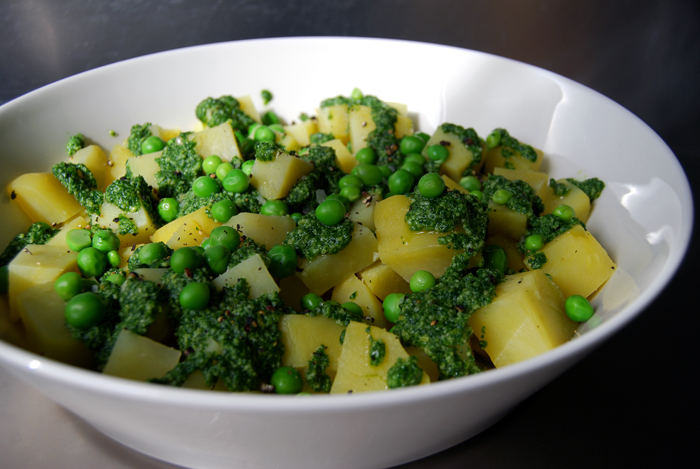 In a large bowl, spread out the potatoes and peas and dollop the pesto on top. Sprinkle with sea salt and crushed black pepper. I made this today. It was both lovely to look at and lovely to eat, happily, by myself, in the empty house. 🙂 I’m happy you liked it Bethany! Potatoes and pesto are a great combination! Once in a while I love these relaxed evenings by myself too, I take my food to the sofa, get cosy and enjoy the silence! Yummy, yummy…some of my favorite ingredients!